Conservatives Of The Upstate: Trump pick questioned because of Russian ties? 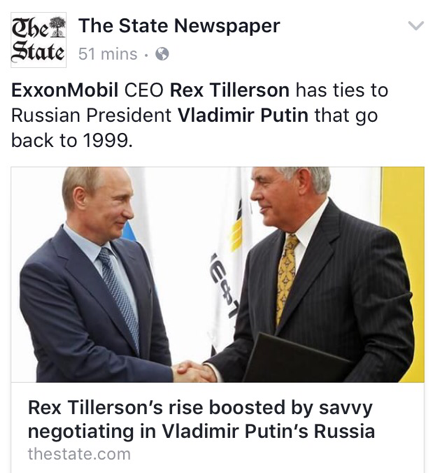 ALL energy companies have to negotiate with Russia - they produce a lot of energy. Duke Energy negotiated used nuclear missile cores with Russia. True statement. The US Solar industry has to negotiate materials. I question the pick because of the greed of the industry but not because of a perceived enemy - but China and Saudi Arabia are far far more dangerous and I'm positive Tiilerson has experience with them as well.